Learn how to adjust the seats in a next-gen smart. Slide the seat forward or back by pressing in on the bar in the front of the seat, and adjust the angle of the backrest by pulling the handwheel on the right side of the seat. In the Mercedes car2go, the controls are on the door and are in the shape of a seat. Select the button that corresponds to the area of the seat you wish to adjust. Push or pull the buttons to move the seat towards the desired direction. Are headlights automatically on at night? No- your dash may glow, but that doesn’t mean your lights are on. If in a smart car2go, make sure to twist the knob with the headlights icon all the way counterclockwise (away from you) before driving at night! To confirm they are on, the green headlight icon will display on the dash. In a Mercedes-Benz car2go, turn the headlight button to Auto. Are there any surcharges when taking a long trip? You can drive up to 200 kilometers, after which you will be billed 45 cents per km (plus tax) in addition to the standard trip rates. If you booked a car2go package, once your package time expires, you’ll pay the car2go package price and then the normal minute rate for each additional minute of your car2go rental. Once the mileage limit of your car2go package is reached, you’ll pay the long distance rate for each additional mile ($0.45 + taxes) for the entire duration of your trip. This applies to trips over 24 hours, too. British Columbia: Beginning on April 1st, 2013, trips lasting longer than 8 hours will be subject to a $1.50 Passenger Vehicle Rental Tax (PVRT) per trips lasting over 8 hours, per day. Can I book a car2go package in advance? Trip packages can be selected at any time during the 30 min. reservation period. Packages cannot be purchased or modified once you have entered the vehicle. Can I book a reservation on the website? The map is currently view-only. To reserve a vehicle, please use the app (iPhone, Android, Windows, Blackberry) or call us anytime 1-877-488-4224 (US) or 1-855-454-1002 (Canada). Learn how to reserve a car2go using the app here! Sorry! Once you have set your username at registration it cannot be changed. Can I end my trip before a parking restriction takes effect? Since you never know when another car2go member will use the car next, a trip should never be ended in a time-restricted parking space regardless of when the time restriction begins or ends. Time restricted parking areas include valet zones, commercial zones, customer service zones and no parking zones. For more details on parking restrictions, check your location's parking page. Can I leave a car2go anywhere in a parking garage? No, unfortunately not. You may only park in a garage if you're in stopover mode, or if the garage has designated spaces marked with a car2go sign. This ensures that all members can locate the car2go easily. Nobody likes to walk around aimlessly looking for their car2go. In Toronto, there are dedicated parking lots and spaces just for car2go. In Green P lots, you can park in any available parking space within that dedicated lot. And for Impark and other lots, be sure you only park in dedicated spaces marked specifically for car2go. Can I park perpendicular to the curb? Unless otherwise marked, car2gos must be parked parallel to the curb. Even though a car2go may fit, parking perpendicular to the curb is illegal and may result in a parking citation. Can I share my car2go account? Unfortunately not. We approve each member individually for insurance purposes. If you know someone who wants to use car2go, please have them register and drive using their own account. If you would like to have two accounts bill to the same account (e.g. for family members) you can log into your account on our website and add a Co-Driver. A Co-Driver is someone you trust that you invite to share payment and/or share recent trip history with. You can add a Co-Driver from your online account. Sharing is caring and many car2go members use the vehicles, so please do not smoke inside a car2go (this includes e-cigarettes). If you smoke in the car, there's a $100 fine (+taxes). Can I take car2go on highways? Yes, car2gos are able to go on highways without a problem - give it a try! Can I take my car2go across state/province/international borders? No, you cannot take a car2go across borders. You may leave the Home Area with the car, but it must be returned to the Home Area. If you are running an errand outside of the Home Area, then simply select 'stopover' from the in-car screen and take the key with you until you return to the car. Can I use car2go credit on multiple accounts? Unfortunately, no. car2go credit is applied to trips taken on your default profile. To change your default profile, log into your account on the website. Can I use car2go credit to pay for trip packages? Sure! car2go credit is applied automatically to trips charged on your default payment profile. This includes trip packages. Can children ride in a car2go? Yes- the smart fortwo and Mercedes-Benz car2go models feature highly efficient restraint systems that meet Mercedes-Benz’s passive safety standards. Please note that children in a rear-facing car seat may never be seated in the front passenger seat. If you are traveling with a child in a rear facing car seat it is recommended you use a Mercedes-Benz car2go so they may ride in the back seat. Infant or child restraint systems (booster, infant or child seat) can be affixed properly to the seat by means of the safety belt. A ratchet mechanism locates the tightly pulled safety belt and holds the infant/child restraint system in position. An electronically controlled system will detect the weight of the occupant on the passenger seat or the installation of a child restraint system. The Electronic Control Unit (ECU) determines the appropriate mode of the dual stage, full-size front airbag deployment. For very young passengers, for whom an airbag deployment could mean a serious risk, the front and side airbags will be deactivated. A control lamp in the center of the roof panel will show this clearly. Always check the control lamp to make sure the airbags are deactivated for very young passengers. It should be glowing and say "passenger side airbag off." Can my pet ride with me? Pets are allowed to ride in car2go vehicles only if they are secured in airline-approved pet carriers. Charges can be applied if there is fur left in the vehicle. Do I have to do an inspection every time I enter a vehicle? Yes. All damage must be reported at the start of the trip to avoid liability. Minor damage can be reported via email (please send us pictures where applicable), while major damage should be reported and the team will prompt you if the car should be taken out of service. Flat tire? Report flat tires before or during a trip to 855-454-1002 and we will help you locate another vehicle. Never drive on a flat tire as you can be held liable for any extended damages. Nope! You are not required to reserve a car2go – simply walk up to any available vehicle and go. Should you choose to reserve a vehicle, you may do so on the official car2go app, up to 30 minutes in advance - for free! Have future plans? You can drop a radar to alert you when one is near. Here's how. Do you accept International Driver's Licenses? Not sure how to obtain your driving record? You can find out how to get your driving record, depending on your country of residence. If any of these documents are not in English, please provide us with a certified translation. Does car2go have 4-Door Vehicles? Yes! More doors. More possibilities. We have Mercedes-Benz GLA and CLA vehicles in many of our car2go cities. Find out more about these vehicles here. How am I billed for car2go trips and how does pricing work? car2go accepts VISA, MasterCard, and American Express for all trip costs and payment for your trip will be charged on a daily basis to the payment method linked to your account. car2go offers a convenient by-the-minute rate for short trips, and multiple packages for 1-hour, 3-hour, 6-hour, 1- and 2-day trips. The minute rate is charged based on how long you use the vehicle (including stopover time). Each package has a set price and mileage limit. Check your city’s Rates page for more details. You may change or update your payment method on our website at any time by logging into your account (Note: VISA debit is not accepted in Canadian cities.). How can I contact car2go? 24/7 Support: 1-855-454-1002 or on Twitter @car2go. Note: For emergencies or immediate support, please call our 24/7 support line. The number can be found on the official car2go app under "Contact Us." Becoming a car2go member is easy. Simply sign up at car2go.com or via the official car2go App. We’ll process your registration within 1 – 2 business days, and you’ll receive confirmation emails from us along the way. Members with Probationary Licenses will be required to comply with any additional restrictions imposed by their respective government agency. **Quebec also offers a Restricted License. These licenses are issued if a driver has excess demerit points or an alcohol-related conviction and only allow the license holder to drive for “livelihood” reasons. We can never accept a Restricted License in Quebec. How can I tell if a car2go is available? Only available vehicles are displayed on the official car2go App. If you are at a car2go and are unsure if it is available, please check the windshield display for the current status. You can update personal and payment information, and view recent trips by logging in here. How do I begin a trip with my phone? Learn how to begin a trip using your smartphone with Mobile Access. How do I end a trip with my mobile phone? Learn how to end a trip using your smartphone with Mobile Access. Always verify your trip is completed before walking away - 'Trip Completed' will be displayed on windshield reader or the app, and doors will lock. 1. Place the key back into the holder. Note that key placement differs by car model- see the question “Where is the key located?” for more information. 3. If everything looks good (windows up, lights off, etc. ), tap "End Rental" in the app. Once the countdown is done, you’ll receive a pop-up on the app alerting you that your rental was ended successfully. See ya later! How do I know if a promo code was successful? During registration, a check mark will appear next to the “Promotion Code” field indicating the entered promo code is valid. How do I rent a new Mercedes-Benz car2go? All of the new Mercedes-Benz vehicles are outfitted with the latest car2go technology, which means you’ll be able to begin and end your rentals seamlessly within the car2go app. These vehicles will be marked with a smartphone-only icon in our app, and you can use the filter function to locate all available Mercedes-Benz car2gos in your area. When starting your trip you’ll find that the key is now stored in the glovebox. Ending your trip is a bit different too. 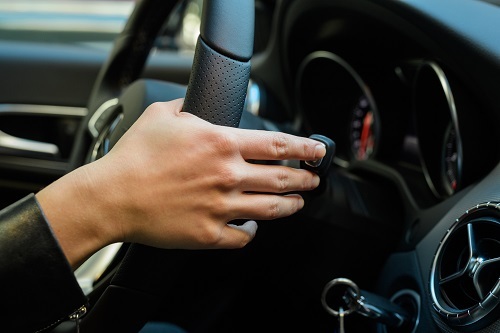 You’ll need to return the key – blue keychain first – into the slot in the box in the glove compartment just like you found it when you started your trip, and then EXIT the vehicle. Once outside the vehicle, simply tap “End Rental” in the app to end your rental. Watch the new rental process here. How do I use my car2go credit? car2go credit is applied automatically to trips charged on your default payment profile, which must be selected in the app when starting your trip. Credit is valid in the country in which they were issued (so if you receive credit in Montreal, you can use them in Vancouver, but not Austin), and is also automatically used to pay for the Driver Protection Fee, airport fee, and other charges that occur during a rental. Tickets, tows, and any other fines that are not part of a regular car2go rental cannot be paid for with car2go credit. How do I use the e-brake and windshield wipers in a car2go? Learn how to use the e-brake and windshield wipers in a Smart car2go.Or, learn how to use the e-brake and windshield wipers (twist the end for front wipers and slide the middle button up for back wipers) in a Mercedes-Benz car2go. How do I view my recent trips? Easy! All recent trip details can be found within the official car2go app under "My trips" and under the "MyAccount" section of our website. How is car2go credit applied to my trips? When available, car2go credit is applied automatically to trips charged on your default payment profile. For example, if you have $10 in car2go credit on your account, and the cost of your trip is $8.00 including taxes and other fees, your invoice total will be $0.00 and you will have $2.00 in car2go credit remaining. car2go credit can be used to cover the cost of packages and other trip-related charges, such as the Driver Protection Fee or airport fees. car2go credit can be applied to trips in any car2go city in the country in which the credit is granted. Please note: car2go credit can take some time to show up on your account, has an expiry date, cannot be applied to previous trips, is only available on your default payment profile (selected during the rental process in the app), and cannot be used by other drivers or other payment profiles on your account. You can monitor those details in your account by logging in on the website or in the app. A vehicle may not be used for more than 24 hours unless you have selected a Trip Package for a longer duration. If going on a longer trip, be sure to pick a package with the appropriate time allotment and mileage. If your package time expires, you’ll pay the car2go package price plus the minute rate for each additional minute of your car2go rental. Similarly, once the mileage limit of your car2go package is reached, you’ll pay $0.45 + taxes for each additional mile / kilometer for the entire duration of your trip. How long is car2go credit valid for use? Each time you receive credit, it is valid for 30 days, unless otherwise stated. You can check the expiry date of your credit in the app or on the website. Note: Credit is only valid in the country in which it was issued and can only be redeemed on your default payment profile. Credit cannot be redeemed by co-drivers. How much does car2go cost? There's an initial one-time registration fee to become a member ($5 plus tax). Minute rates and packages vary by city - check out your city's Rates page for more details. Note that each trip will also be charged a Driver Protection Fee: $1 per trip (up to the first 200 trips in a calendar years). In a next-gen smart car, unlock the car (on the fob or inside), press the center button on the glass door in the back and lift up. Then pull the handle on the top of the bottom gate. Open sesame! To open the trunk of a Mercedes car2go, you can press the button on the side of the driver’s side door or press unlock twice on your car key and press the button located just above the back license plate. Learn how to use the Radar function on the car2go app. I found a parking ticket before I used the car. What do I do with it? No need to worry - place the ticket in the glove box area and we'll take care of the rest! I refueled a car2go - are you going to reimburse me? Yes. $5.00 will probably get you where you need to go, so just fill up a bit and we’ll take it from there! Our vehicles require fuel with an octane rating of 91 or above. Should you need to refuel a vehicle to complete your desired trip, feel free to do so! Just send us an email to memberservicesCAN@car2go.com with a picture of the receipt, the license plate number of the vehicle you drove, and time of your trip. We’ll confirm the refuel and reimburse you with car2go credit to use towards a future car2go trip. I was approved! How do I start driving? Congrats! To get started, locate a car2go through the official car2go App. You can then reserve and access a vehicle with our App. Check out our videos for more information. If I pick up a car2go in a private parking area, am I allowed to return it to the same place? No, we wouldn't want you to receive a citation or tow for the improperly parked car. If you find a car2go in unauthorized parking please send us an email so we can remind the previous member of our parking policy. Don't forget that all car2gos must be parked according to each Home Area's parking rules or in designated car2go parking. If the car lets me end my trip, I'm good to go, right? Not necessarily. When ending your trip, it's always important to verify that you've parked in accordance with the car2go Parking Rules for your city. Send us an email of the item you found and the license plate to memberservicesNA@car2go.com and we'll take care of it from there! Lose something? Send us an email and we'll let you know if it's in our possession. For something more urgent, like a wallet, give us a call and we'll help with the next steps. Please note that car2go is not responsible for loss of or damage to a member's property or the property of others left at any time in or on any vehicle or on car2go's premises, even if it is in car2go possession and regardless of who is at fault. car2go may hold lost and found items for up to 90 days depending on the local laws. Learn how to reserve a car2go Don't worry, reserving a car2go is not required but it is recommended. Learn how to view recent car2go trips on the app. What are Smartphone-Only Vehicles and how do I use them? Please note: the newest generation of car2go vehicles are only accessible via smartphone. In addition, these new car2go vehicles include Bluetooth, charging cables, and enhanced GPS navigation so you can play your own music and charge your phone while seamlessly navigating to your destination. 5. After entering the Access Code, the vehicle will unlock and you’ll find the key to the left of the steering wheel. Insert the key in the ignition and off you go! To learn more about Smartphone-Only vehicles please check out the video. What are the other fees and charges? For the most part, trips will start and end smoothly for yourself and the next passenger, however, there are some costs occasioned by improper use. These fees are designed to keep the service running smoothly for everyone in the community. This way, everybody benefits in the end. What does the car2go and DriveNow joint venture mean for me? As you may have heard, car2go has joined forces with carsharing player DriveNow to become SHARE NOW. It's kind of a big deal, because together we'll be the world’s largest carsharing provider. In the future, this means a larger fleet, more premium cars such as BMW and MINI, and more carsharing cities around the world – all in one app. What does the car2go app do? Learn how to use the app here - it's easy! What happens if I don’t use all the time in my package? Trip Packages are non-refundable and leftover time cannot be applied to future rentals. What happens if I stop somewhere during my trip? You can do a stopover somewhere like a grocery store or friend’s house without ‘giving up’ your car – simply turn off the car and take the keys with you. If you didn’t book a package, the minute rate will still apply (think of it like keeping the meter running). If you did book a package, when you make a stopover, simply take the key with you to keep your rental active. If you return the key to the holder both your rental and package will end. What happens if a car2go I parked is ticketed or towed? You are responsible for any fines assessed during or after your trip if you improperly park the vehicle or leave it in an unauthorized area. In addition to the fines and/or tickets, you may also be responsible for car2go service fees. For more details, check out the parking rules for your city in the "Parking" section of our website or contact us at MemberServicesNA@car2go.com (if you're in the U.S.) or MemberServicesCAN@car2go.com (if you're in Canada). What if I go over the time that’s included in the package? Sometimes trips take longer than planned! If your rental exceeds the time limit associated with the Trip Package, your trip will not adjust to another package, instead you’ll be billed by-the-minute for the remainder of your trip. What if I need roadside assistance or get in an accident? Don't worry, car2go has support around the clock! What if I'm having trouble starting rentals with my app? Tip: try turning off Wi-Fi - it can help with any interference from surrounding networks. Next, make sure your car2go app is on the most up-to-date version, and that your phone's operating system is up to date too. Finally, you can clear the cache from the car2go app (found in your phone's settings). If that doesn't help, give us a call at [FOR US- 877-488-4224]/[FOR CA- 855-454-1002] and we can help you out! What if the car won’t go into park? If in a smart fortwo car2go, you will see on the gear shift that there is a +/- for manual shifting. Make sure the gear stick is all the way to the right before attempting to move to park. If you have further trouble, please give us a call and we'll help out! If in a Mercedes-Benz car2go, press the button on the end of the gear shift. The gear shift is the lever located on the right side of the steering column. What is "private parking" and am I allowed to park in those spaces? Please make sure to always leave a car2go on-street unless it is a designated car2go parking spot. All private, off-street parking is prohibited because it could get towed. This includes residential driveways or garages, shopping centers, apartment or office building parking lots/garages, or paid parking lots/garages. What is "legal on-street" parking? Parking legally on-street means using public roads within the Home Area that do not have additional signage prohibiting parking (ex: valet, taxi or pedicab zones, or commercial zones). Be aware of parking restrictions at specific times or on specific days (ex: commuter lanes and street sweeping). To access manual shifting, simply shift the gear all the way down, and then to the left. You will see on the gear shift that there is a +/- for manual shifting. This will alleviate the lag between gears. Tip: get up to about 20-25 mph before shifting up to 2nd. Downshifting when going up hills is a good way to get more umph, also. There is an arrow that will appear on the dash when it wants you to shift up, but the car is capable of downshifting itself when slowing down. If you don't want anyone else to take the car2go you've been using, or if you’re driving to a destination located outside of the Home Area, lock the car2go and keep the keys. This is called a Stopover. You are charged for the entire time that you are logged in to the vehicle, even while it is parked. A Stopover is useful for running errands or even for a quick trip to the store. Don’t forget to take the keys and lock the car! car2go provides hundreds of vehicles that can be accessed on demand. No reservations required! Unlike traditional carsharing programs, you can make one-way trips within the designated car2go Home Area. This means that you can use the vehicle for as long as you like, without committing to a specific return time or location. You can end your trip in any authorized parking space within the car2go Home Area. Don't worry about late return fees! With car2go, you pay as you go, and our by-the-minute pricing includes the costs for fuel, insurance, parking, and maintenance (basically, we've got you covered). What is the Driver Protection Fee? The $1 Driver Protection Fee enables car2go to charge a deductible that is under $1,000 to its members in the event that they get into an accident while driving a car2go. For each trip, a member is charged a $1 (plus taxes) surcharge. This $1 surcharge is only charged for a member’s first 200 trips in a calendar year. After the 201st trip, the member is no longer charged the $1 surcharge. And, starting January 1, 2018, any member who takes 91 or more trips by the end of a calendar year will have their deductible lowered to $0. At the beginning of each new year, the trip count will rest to 0 and the deductible will be reinstated. What is the Home Area? Can I drive outside of it? The car2go Home Area is our operating area in which you can begin and end your trips. You can make a stopover outside the Home Area, but you must be within the Home Area to end your trip. There is a limit for going outside of the Home Area - only up to 200 miles in the USA or 300 kilometers in Canada. Learn more about car2go Home Area. car2go’s insurance meets or exceeds the statutory minimum financial responsibility limits for each jurisdiction where it operates. Coverage only applies if you abide by the Terms & Conditions and Trip Process for the jurisdiction in which you are operating a car2go vehicle. What is the next-gen smart car? The next-gen smart car is car2go’s newest addition to the fleet. There are a few differences between the next-gen (453) and our 451 fleet. For starters, they are smartphone-only vehicles meaning the trip can only be started via the car2go app. You can find them on the app identifiable on the app as smart fortwo new as well as by an orange smartphone only icon that indicates you need to start your trip via the car2go app. For a list of how-tos regarding common questions like headlights, ending rentals, bluetooth and more, click here. What kind of vehicles does car2go use? Our fleet consists of the next-gen smart and Mercedes-Benz GLAs and CLAs. You can hop in and drive a Mercedes in Austin, Portland, Seattle, Vancouver, Denver, New York City, Montreal, Calgary, and Washington DC. Additionally, some car2go vehicles are equipped with Bluetooth technology and charging cables for your phone. *Parking isn't always free everywhere. Some locations in the Home Area may charge an additional fee, such as airport and other special zones. Check out your local parking page for more details. You’ll be able to drive once you receive an email from us letting you know your membership has been processed. Please keep in mind that it can take 1-2 business days for processing - but it's worth the wait! Members with Probationary licenses will be required to comply with any additional restrictions imposed by the respective government agency. Parking rules are different for every city. You can park in any legal on-street public parking space within the Home Area that abides by the car2go parking rules. You can find all the details on your city's parking info page. Where is the key located? • In the next-gen smart, the key is stowed key chain fob first in its holder to the left of the steering wheel. Please note that there is a round silver button you will need to push to eject the key blade. 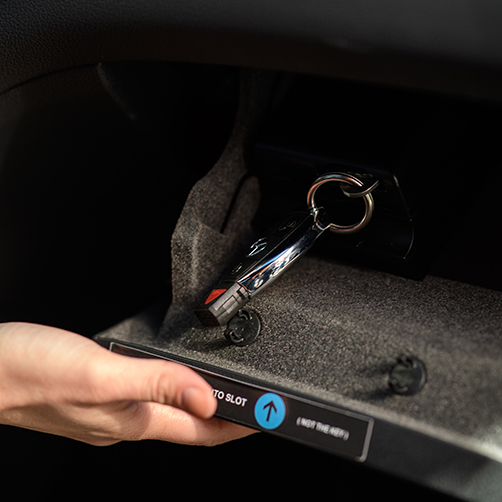 • In the Mercedes-Benz car2go, the key is stowed key chain tag first in its holder inside the glove compartment. Who can register for car2go? Anyone! There are just a few requirements members need to meet to be covered under our insurance. A member needs to be at least 18 years of age and have a reasonable amount of driving experience; so members cannot have a learner’s permit or be a “new” driver. Also, a member must have a driver’s abstract in good standing, with no alcohol- or drug-related violations. Offenses under the motor vehicle code will be examined — and their severity can negate membership. Why was I denied membership? A driver's license is currently suspended, revoked or expired. Convictions for reckless driving within the past 60 months. Convictions for driving under the influence, driving while intoxicated or driving while impaired within the past 60 months. Three or more moving violations within the past 36 months. Failure to report an accident or leaving the scene of an accident within the past 36 months. If you would like for us to check your records again feel free to send a copy of your driver's abstract to car2go for a manual review. Winter is coming - are car2gos prepared? Similar to other vehicles, winter driving can be tricky in a car2go. Lucky for you, our entire fleet is equipped with Electronic Stability Programs, Anti-Lock Braking Systems, crash management systems, and full-sized airbags. In our snowier markets, car2go vehicles include all-season tires, ice scrapers, and sometimes even heated seats! Montreal car2gos come equipped with snow tires so you're always prepared.